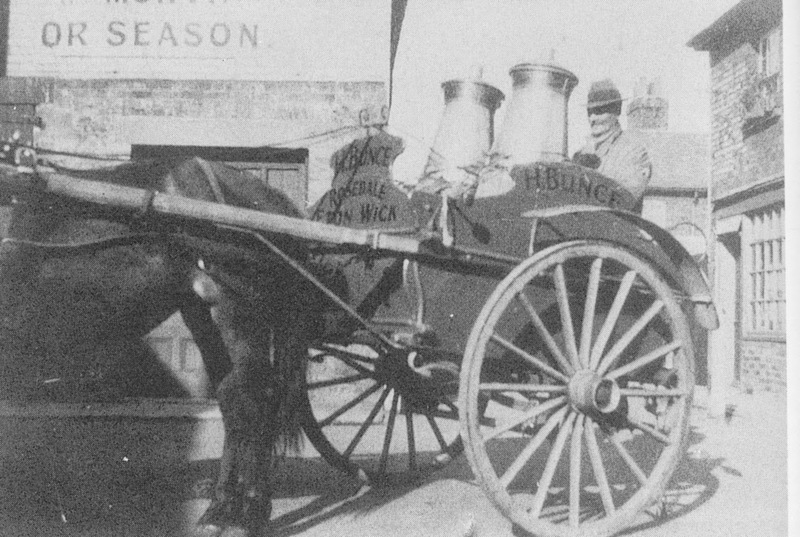 Milk rounds were a major feature of Eton Wick farmers and smallholders. Up to the 1930s there were some 20 milk producers, ranging from owners of one or two cows to pedigree herds in Eton Wick and in the villages around its borders, and 7 or 8 delivery rounds, many of them to Eton College Houses. probably pre-1939/40 war. Note the old fashioned churns. Roundsmen had to be particularly quick when stepping onto their floats, as their horses, knowing the rounds so well, proceeded on their way immediately they felt a change in the balance of the float shafts. It was not unknown for College boys to hold their smaller colleagues under the delivery horse's nose in the hope the horse would bite. Some of Harry Bunce's farm is part of what is now known as Bunces Close housing estate. Harry's home was 'Rosedale', a detached house next to the old parsonage. 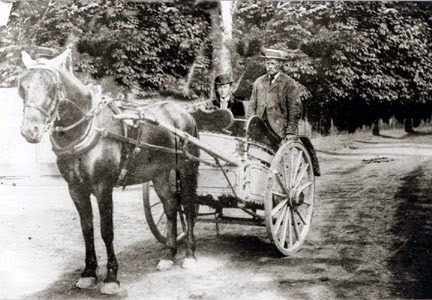 It was said that Harry had no right of way from his farm to the Eton Wick Road, and used to drive his horse 'Kitty' and trap along the Common to Eton Wick. In times of flood, George Tarrant allowed him to drive through Crown Farm (Harry's sister Charlotte was married to George's son Alf, which presumably helped). Harry served on the Eton Wick Parish Council and several other committees. pictured on their final round in 1993. They were the last local operators. 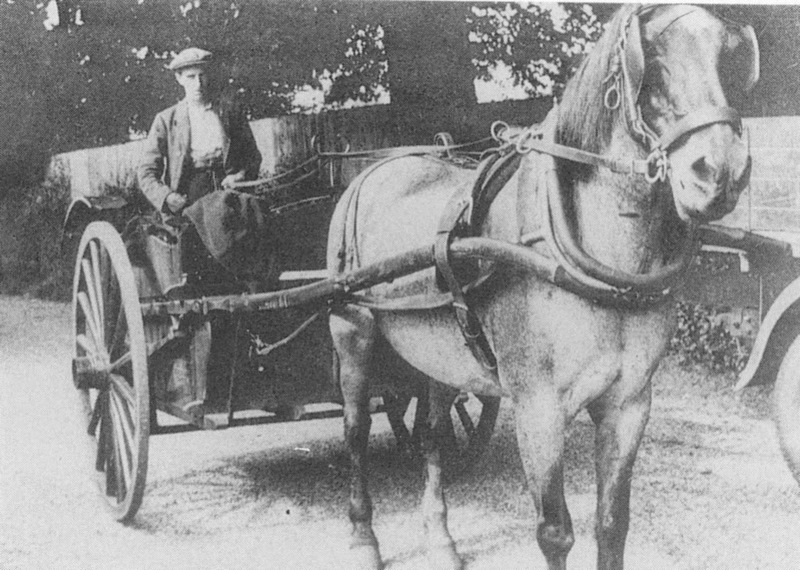 Cyril Tarrant on the Saddocks Farm milk round c1930-32. The milk was ladled from the churns to the customers' jugs. Cousins Bob and Reg Tarrant also ran milk rounds from Manor Farm and Crown Farm, respectively. 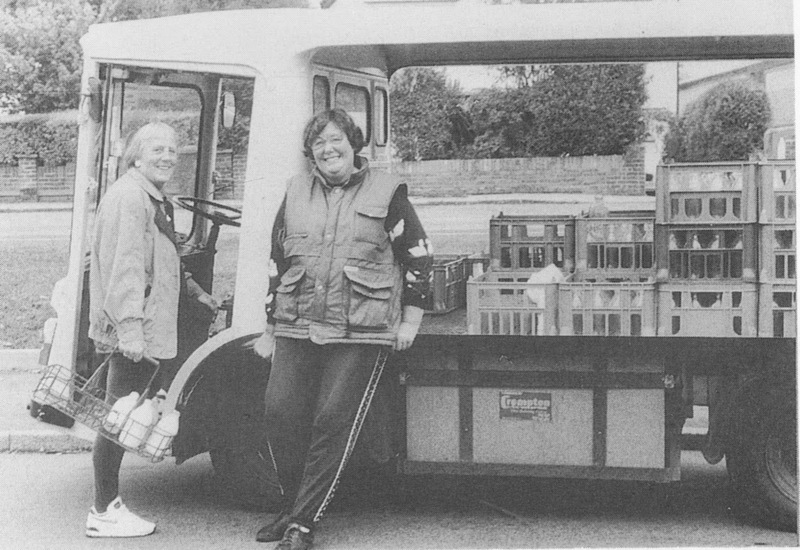 When it became compulsory to retail only milk that had been pasteurised, the milk was collected in tankers from the farms and processed by specialist dairies such as Neville & Griffin of Slough. Some farms initially brought the processed and bottled milk back to their farms and continued their own rounds. In the main it was left with the processors to retail the product. These were the post-war days of the Milk and Egg Marketing Boards. Cyril took over Saddocks Farm from his father Arthur. Besides growing feed crops for dairy and beef cattle, the farm grew cereals; pigs were kept by Arthur and chickens by Cyril.